DOC ARDAN: THE TROGLODYTES OF MOUNT EVEREST + THE GIANTS OF BLACK LAKE by Guy d'Armen adapted by J-M. & R. Lofficier; Cover by Yoz. $22.95, 5x8 trade pb, 292 pages. ISBN: 1-978-61227-483-6. 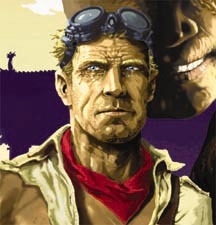 In The Troglodytes of Mount Everest (1929), young Francis Ardan, who has just earned his title of Doctor, embarks for a cruise around the world, but ends up fighting Captain Mendax, a science pirate and the master of a super-powered flying machine and submarine, The Astaroth, built according to the late Captain Nemo's designs. In The Giants of Black Lake (1931), Doctor Ardan comes across an underground city in Mongolia ruled by the fearsome Kyzyl Kaya, a 250-year-old scientist who has created a horde of giant spiders and other colossal creatures to guard his lair and conquer the world. DOC ARDAN: CITY OF GOLD AND LEPERS by Guy d'Armen adapted by J-M. & R. Lofficier; Cover by Dean Zachary. $20.95, 5x8 trade pb, 256 pages. ISBN: 1-932983-03-1. Tibet, 1927. Intrepid explorer Doctor Ardan is taken prisoner by the diabolical Natas, who has discovered the secret of making gold through nuclear fusion, and rules over a city of slaves whom he controls with an unholy brand of leprosy. Can Doc Ardan, with the aid of beautiful Louise Ducharme, thwart the Oriental Mastermind's evil schemes and escape from the City of Gold and Lepers? The City of Gold and Leperswas a prophetic science fiction / adventure novel written by Guy d'Armen in 1928, probably inspired by Fu-Manchu (1913) and predating Doc Savage (1933).